Under its 1991 Constitution, the Republic of Colombia recognises the primacy of “inalienable rights”.Art. 5, 1991 Constitution of Colombia.The right to life is inviolableArt. 11, 1991 Constitution of Colombia.and no one may be subjected to forced disappearance, torture, or cruel, inhuman or degrading treatment or punishment.Art. 12, 1991 Constitution of Colombia.The right to association and public and peaceful assembly are guaranteed and may only be limited by law.Art. 37, 1991 Constitution of Colombia. Chapter 7 of the Constitution is dedicated to the “Public Forces” (Fuerza Publica), which comprise the military and the national police.Art. 216, 1991 Constitution of Colombia.Article 218 defines the National Police as a permanent armed body of civil nature whose main goal is to maintain the necessary conditions conducive to the exercise of rights and freedoms and to ensure peaceful coexistence (“convivencia”) to all those living in Colombia. Article 221 (modified by Legislative Act 01/2015) applies the Military Criminal Code to the National Police and determines that the military tribunals have the jurisdiction to judge crimes allegedly committed by officers while on duty. Public security and the handling of public demonstrations are generally the exclusive responsibility of the National Police. Only in extreme situations and for a limited period only may the police request the assistance of the military.Art. 170, 2016 Police Code.According to Article 8 of the 2016 Police Code, police use of force must be necessary, proportionate, and reasonable in the circumstances. Article 10 obligates the National Police to respect and ensure the rights protected under the Constitution of Colombia. 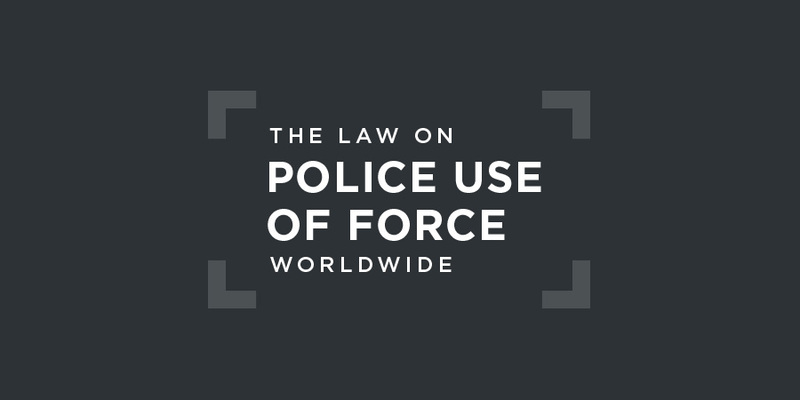 In 2017, a specific regulation was adopted on the use of force, firearms, ammunition, and non-lethal weapons. The regulation, which was adopted by Resolution 2903/2017 of the General Directorate of the National Police, specifically refers to both the 2016 Police Code and the 1990 UN Basic Principles on the Use of Force and Firearms. The regulation states that the use of firearms is only acceptable in self-defence or defence of others in case of imminent threat of death or serious injuries, or the imminence of a criminal act that may pose a threat to life. A subsequent regulation prohibits the carrying of firearms by police officers engaged in managing demonstrations. There is no specific independent civilian body created to oversee the actions of the National Police in Colombia. While criminal cases are subject to the jurisdiction of the military tribunals, disciplinary offences are dealt with by the Attorney General's office. The Office of the Prosecutor of the ICC is investigating alleged crimes against humanity committed since 1 November 2002 in Colombia. While most of the allegations concern the armed forces, some may concern law enforcement agencies. although there had been fewer reports of alleged extrajudicial executions over the past four years, new cases continued to be documented, and that most investigations had focused on low-ranking commissioned and noncommissioned officers. OHCHR called upon the State to ensure the provision of complete information to the Court about investigative advances against high-ranking officers in “false positive” cases. In addition, the Human Rights Committee expressed its concern at reports that members of the police mobile anti-riot squad and the army had used excessive force during public demonstrations, apparently resulting in loss of life and injury. This case concerned the killing of five women human rights defenders during operations by the state, including the police. The Court found that the government had failed in its obligation to guarantee the life and physical integrity of the community leader, Ana Teresa Yarce, and that it had violated the rights to freedom and physical integrity and free association of the other female leaders: Socorro Mosquera, Mery Naranjo, Luz Dary Ospina and Miriam Rua. The Constitutional Court clarified in a 2006 judgment that only those measures "necessary and efficient to re-establish public order" should be adopted by the police. The use of more extreme measures must always be a last resort: police action must be ruled by the principle of necessity as defined by the UN Code of Conduct for Law Enforcement Officials.Corte Constitucional, Judgment, C-179 (2006).